Inbound marketing has revolutionized the way we interact with businesses. Unfortunately, many companies still rely on traditional marketing methods which interrupt consumers with a message they don’t want or need. You probably don’t like getting spam emails or loads of snail mailed promotions. Most people end up stacking them up somewhere or throwing them away rather than putting them to use. Thankfully for businesses, there is a far more effective way to reach a target audience: a permission-based digital marketing approach. This approach turns strangers into brand advocates. 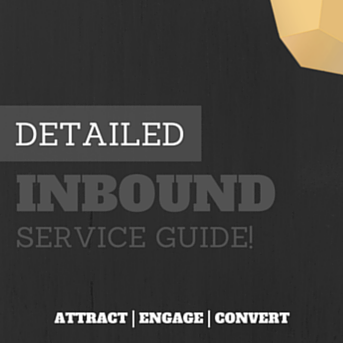 It’s called “inbound marketing.” The inbound methodology starts with four stages. First, attract visitors to your site. You can start out by posting on social media or writing blog articles. Next, narrow down your list of visitors to determine which ones are qualified leads. It’s great to have a million users visiting your site, but if they never become customers, the number doesn’t really matter. It’s much better to have 100 qualified leads visit your site than thousands of bounce hits. Some great ways to help determine which visitors are ‘qualified’ is to create things like calls to action. Calls to action, or CTAs, are buttons on your site that take visitors to a specific landing page. Once they reach the landing page, they’ll be prompted to download an offering. It could be an ebook, a white paper, a how-to guide, just about anything! These assets are all designed to bring potential customers straight to you. If a visitor is interested in an offering from your business, they will submit personal information into a form on the landing page to receive it. This form helps your business ask questions that can nurture the lead to become a customer. It allows them to “opt-in” and engage when they are ready. Again, the offerings should be relevant to your best customer – your “buyer persona(s)”. They should really address their needs and demonstrate the benefits of your good or service. The third stage is closing the deal and turning qualified leads into customers. To do this, deliver the offering as promised. You can set up automated emails and workflows to help nurture your leads and build trust. When customers convert this way, they have considerably shorter sales cycles than ones converted by traditional marketing methods. Moreover, customers nurtured by inbound methods are more likely to become advocates of your business. This is the last phase, the delight phase. Once you have gotten a customer, your job is not over. Continue to nurture the relationship so you can use their stories for events in the future. You can encourage them to share social media posts. A delighted customer can become your best sales person. FOR MORE GREAT MARKETING TIPS DOWNLOAD OUR FREE GUIDE!